The claim by Joan Burton today in the witness box that she is in effect a direct political descendant of James Connolly by virtue of being an ex- leader of the Labour Party drew a combination of gasps and sniggers from most people assembled in the courtroom. A cursory search for the name James Connolly and Jim Larkin on the Labour Party website will throw up lots of references to both these towering giants of the Irish labour (small ‘l’) movement. If you can bear to watch the televised parts of Labour Party conferences to this day you can still hear some delegates utter the word ‘comrade’! The Russian Revolutionary Leon Trotsky coined the term ‘holiday speechifying’ back in the 1930s to describe the leaders of ostensibly socialist and labour parties who on special occasions like party conferences and May Day rallies would talk the radical talk. The point being that this talk had no bearing on their day to day conduct which involved rotten compromises and outright sell out of their voters. Labour’s claim to the mantle of Connolly and Larkin was always tenuous at best. At the conference of the Irish Labour and Trade Union Congress in Clonmel in 1912 Connolly and Larkin had a motion passed calling for the formation of a party of labour. However the intrusion of major events not least the 1913 Lockout and World War One cut across any meaningful steps to turn this motion into a reality. The Labour Party of today in reality came into being in the years after Connolly’s execution and Larkin’s long exile in the United States. The calibre of the people at the helm of this party and the trade union movement affiliated to it was frankly not a patch on Connolly and Larkin. In the course of the war of Independence and the Civil War these individuals made no effort to put the stamp of working class interests and socialist policies on events. Instead they took a back seat and helped ensure that the character of the Southern state that emanated was light years from what Connolly and Larkin aspired. The Labour Party has always been first and foremost loyal to the establishment and effectively see this state as the finished form of democracy and that there are official channels through which all grievances we have can be pursued. That explains Joan Burton’s talking up of her family connections with the 1913 Lockout. They view society prior to the foundation of this state as a different country in every sense of the word and back then the militant methods and the radical politics of Connolly and Larkin for them belonged to that time but ceased to be legitimate once the Free State was consolidated. We in the Socialist Party however see society now and back then as the same in its essentials. Connolly’s warning about swapping flags but maintaining a capitalist system has unfortunately been borne out over the last hundred years. 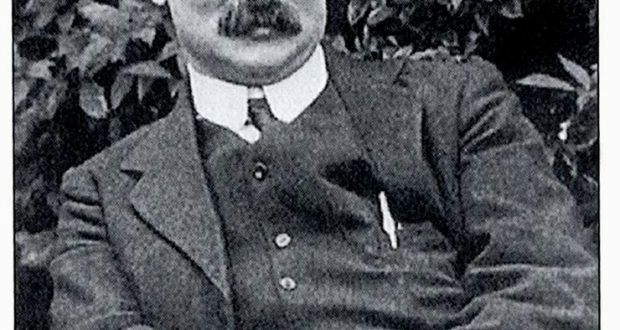 That said we should rejoice in the fact that working class people and the oppressed in this country have taken up the militant methods of Connolly and Larkin in the course of the crisis as seen in the water charges struggle but also in various campaigns and struggles such as Bus Eireann, Greyhound Recycling and numerous workplace occupations. Despite its obvious political deficiencies and periodic betrayals when they propped up Fine Gael led governments in the 40s, 50s, 70s, 80s. 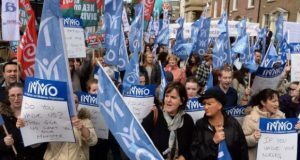 90s and then this decade as well as a short lived coalition with Fianna Fáil between 1993 and 1994 Labour historically commanded the loyalty of a significant minority of left leaning working class people. Periodically battles were waged within the Labour Party, especially in the 1970s and 1980s between the essentially right wing pro-establishment leadership and a various left trends who up until the late 1980s held the common position that Labour should stay out of coalitions with the traditional conservative parties. In the end for reasons beyond the scope of this blog posting the right wing prevailed by expelling the most consistent opponents of coalitionism, the Militant Tendency from which the Socialist Party of today is descended. The other ex ‘lefts’ including Michael D Higgins and Emmett Stagg almost entirely reconciled themselves to coalitionism in the 1990s. This period of the late 1980s early 90s represented the real turning point for Labour. Prior to that time it could be characterised as a “capitalist workers party” which in a sense is a contradiction in terms but reflected a real tension between a capitalist leadership and a certain rank and file pressure from a more working class membership and an organised left. 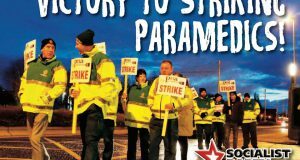 Since that point Labour can be more accurately characterised as an out and out pro-capitalist party with one significant trade union affiliate SIPTU whose leadership puts it under zero pressure to represent its members interests. Much as they might blame Fine Gael for the right wing policies they went along with, it is not as if they would have done much differently had they been the bigger party in government or indeed had they government alone. We only need to look at Spain, Portugal and Greece whose governing parties at the start of the economic crisis were the sister parties of Labour. They all proved to be as faithful to the Troika as Joan Burton did which is why she was so deserving of the reception she received in Jobstown.